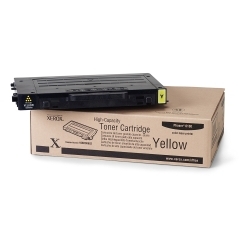 Xerox Phaser 6100 Yellow Toner Cartridge, 5K (106R00682) : Disk-O-Tape, Inc.
Xerox yellow high-capacity toner cartridges ensure extraordinary print quality, superior reliability and competitive cost-per-page. Similar to buying in bulk, Xerox high-capacity toner cartridges give you more for the money, printing an average of 5,000 pages. This toner is also specially formulated for increased print consistency and continuity even on rough papers. Maximize your printer's versatility and performance with our extensive line of PhaserTM color printing media, designed and tested for unmatched print quality and reliability. 1 Average standard pages. Declared Yield based on 5% area coverage on A4/letter size page. Yield will vary based on image, area coverage and print mode. Read Xerox's Consumable yields guide (PDF) and ISO Test Reports for more information.